Lifebanc facilitated the organ donations of 155 people from Northeast Ohio in 2017, a new record for the region. The gifts of those 155 people saved the lives of 418 people. There were 150 organ donors in Northeast Ohio in 2016. Lifebanc, the region’s non-profit organ procurement organization, also recovered 11,338 life-saving and healing tissues or corneas from 774 tissue donors in 2017. One tissue donor can impact the lives of up to 50 people. Donated tissue is used to save the lives of burn victims, replace faulty heart valves, replace damaged ligaments and bones, and in hosts of other surgeries. Donated corneas restore sight to the blind. In all, the donations of Northeast Ohioans have the potential to impact over 39,000 people in need. 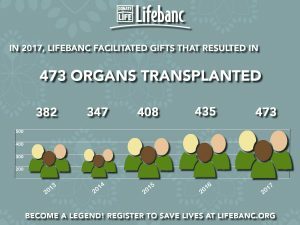 Lifebanc recovered 473 organs for transplant in 2017, an increase of 8.7 percent from 2016. The 418 people saved by Northeast Ohio organ donors in 2017 represent an 8.6 percent increase over last year. The organization facilitated the donation used in the Cleveland Clinic’s third face transplant in April. In the last five years, the number of organ donors in Northeast Ohio has risen 39.6 percent, from just 111 organ donors in 2013. Nationally, 10,281 people donated organs in 2017. National organ donation has risen 24.3 percent in the last five years. Of the organs recovered from Northeast Ohio donors, 346.5 saved the lives of patients at University Hospitals or the Cleveland Clinic. One liver was divided between two donors, with one half of the liver transported to a recipient outside of the region. Organs recovered from our region saved the lives of people in 18 states and the District of Columbia. Organs traveled as far away as California, Texas and Florida. 25 people from Northeast Ohio were able to donate six or more organs last year. Lifebanc’s grief services department supported 2,100 family members of donors during 2017. That included 500 hours of free individual counseling and 60 hours of free support groups. “There are still thousands waiting for an organ here in Ohio and over 100,000 waiting nationwide. We will continue to work towards a future when everyone waiting receives the transplant they need,” said Bowen. 2017 represented the fourth consecutive year that organ, eye and tissue donation increased in Northeast Ohio. However, there are still 115,249 people in the United States waiting for a life-saving organ transplant, and an average of 22 people die each day because the organ they need is not available. 3,049 people are waiting in Ohio, and 1,650 people are in need of an organ in Northeast Ohio. One organ donor could save the lives of as many as eight people. The national organ shortage could be greatly improved, and thousands of lives could be saved, if more people registered their wishes to be an organ, eye and tissue donor. Registering is simple and easy and can be done at www.Lifebanc.org/MoreLife.